Last night, to celebrate me finally finding a decent pair of overalls at the thrift store, Mike and I went to a little Italian place in our neighborhood for appetizers and drinks. Not having typical 9 to 5s give us the freedom to scope out the best dinner and drink specials in Chicago, and we might have found the best last night at Francesca's Bryn Mawr. Small plates were just $5 each, and they were hardly small. Our mushroom risotto and lentil and spinach dish were accompanied with a beer for Mike and a very strong Manhattan for me. I, in typical Lora fashion, got drunk from that one drink and spent the walk home telling Mike (very loudly, with a few slurs) about my childhood adventures wearing overalls. In first grade I used to wear overalls with different colored body suits that snapped at the crotch, so going to the bathroom was a nightmare. Especially for me, who was too shy to ask to use the bathroom until it got to emergency status. When my family lived in North Carolina, my brother and I used to collect tree frogs and put them in the bib pockets so we didn't crush them when we sat down. We'd set them free before coming in to dinner, but every once in a while there would be an extra small one tucked inside our pants we didn't see. One night I woke up to the sound of a frog chirping, and there he was, a tiny pocket tree frog on my pillow. I don't think I'll be storing frogs in my new bibs, but they do hold my phone, keys, and credit card. You may think they're ugly, but I support any garment that lets me leave the house sans purse. Thanks, Kelly! 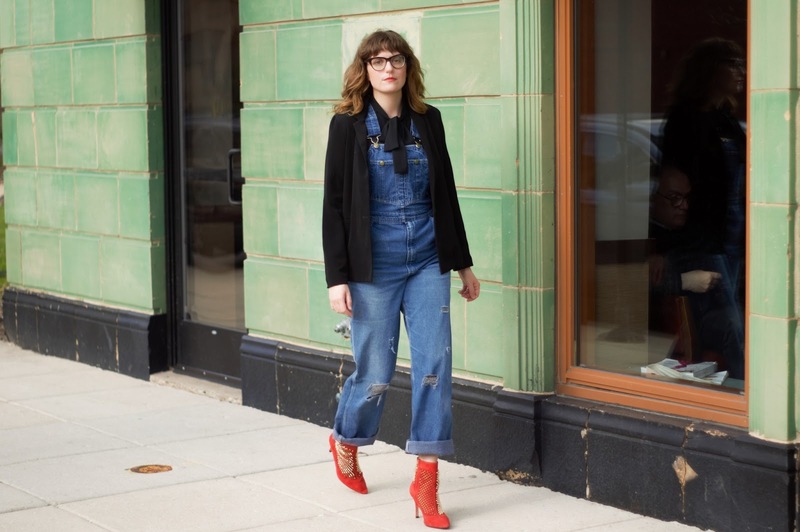 You're overalls are pretty great as well! but since you're not going to, find me a pair that are magically high wasted and distressed mmmmmk? hahahah I'm dying over the frogs. I used to stuff my hamster in that pocket too and they'd always poop! I'm digging the way you styled these overalls, the red boots..I want 'em.